What is the job of a manager? Answer: To solve chronic problems. What is a chronic problem? Answer: A problem that has been legitimized in the budget! So how do we unearth chronic problems? Answer: By proactively challenging the standards and budget. Once identified, how do we solve the chronic problems? Answer: By structured problem solving methodologies, that engage the total thinking capabilities of managers. These methodologies can be for incremental improvement or disruptive innovation. I prefer to blend both methodologies to deliver: faster / better / cheaper / different solutions. Improvement is a logical left-brain activity. With the aid of quality improvement tools one can navigate the diagnostic journey of problem solving. Symptom to Cause. Innovation is a creative right-brain activity. With the aid of creativity tools one can design innovative solutions during the remedial journey of problem solving. Cause to Remedy. The hiccup lies in Problem Definition. We try to bite elephant size problems. We imply blame. We indicate solutions. We blindly solve the wrong problems. Not so at the QualTech Prize Competition. 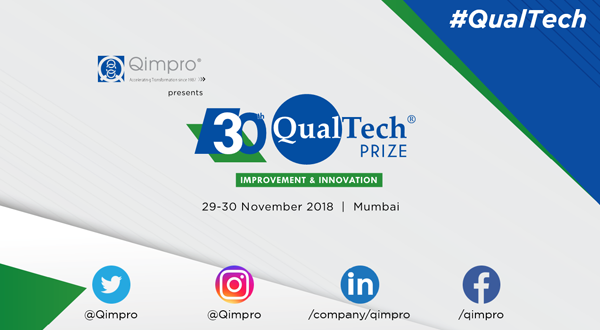 The 30th QualTech Prize Finals were held on 29-30 November in Mumbai. The format was different. Almost 80 project teams from 50 companies competed for the QualTech Prize. After a thorough scrutiny of the project submissions, by multiple proficient examiners, 60 shortlisted projects were judged by 10 Qualitists. The volume being large, this year the presentations were 7 minute videos, followed by a question-answer session. This ensured good time management. Another unique feature for the QualTech Prize Competition was a parallel Quality Fables Competition – The story behind your project! At Qimpro we believe that story telling is an effective communication tool. Therefore, managers must develop this skill. Qimpro can hand-hold an organization to develop in-house Quality Fables.